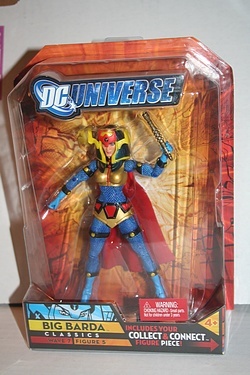 Coming dangerously close to a rut, we'll feature a third DC Universe Classics figure in as many days - Big Barda! Harkening from wave 7 of the line, this figure comes packed with the left arm of the Atom Smasher build-a-figure. Born on the evil, warlike planet of Apokolips, Barda was specially trained in all forms of combat by Granny Goodness. However, she fell in love with Scott Free, a child of peaceful New Genesis raised on Apokolips, and used her warrior skills to help him escape to earth. This figure comes in two variants - with and without helmet, the with-helmet version is featured here. Click on the image for the rest of her bio and some more key pics!